Our Laser Engraving system is able to mark anodized aluminum with truly fine details. 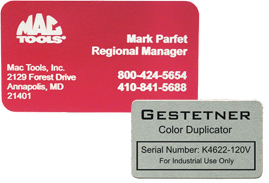 Anodized Name Plates are ideal for dozens of identification applications. Each plate is die cut with deburred edges ready to laser engrave. Rich colors of back, blue and red contrast with the silver/white engraving from your laser. Small text, logos or large fill areas engrave cleanly. Anodized Plates are ideal for dash plaques, industrial i.d. plates, business cards and hundreds of other creative uses. AlumaMark Satin Labels are available in satin silver and arrive with an adhesive back for ease of application in your production setting. Each is available in a variety of shapes and sizes making them a very versatile product. AlumaMark engraves a crisp black color are perfect for small text, bar codes, award plaques, badges, photographs and much more. AlumaMark is intended for indoor use only.